The Progressive Pitch version of Lie-Nielsen’s dovetail saw has some features that make it unique and also a fan favorite. Most production made handsaws have saw teeth that are the same pitch all across the saw plate. For example, if a saw has a pitch of 15ppi, then each inch will have 15 points. In this Progressive Pitch dovetail saw, the pitch gradually changes from the toe to the heel of the plate. At the toe, the pitch starts at 16ppi and progressively decreases to 9ppi at the heel. The picture below displays the range of teeth sizes used on this saw. With handsaws, most woodworkers will find that a smaller pitch makes it easier to start a cut, while a larger pitch cuts more quickly once you get started. That’s the concept behind the Progressive Pitch in this saw and what seems to make it a fan favorite. It’s easy to start using the small-pitched teeth at the toe, and then once you get started, the larger pitched teeth cut quickly. Just remember that when you are starting a cut to hold the saw so most of the saw’s weight is off the wood. Just let the teeth lightly graze the wood, while moving the saw back and forth on your cut line. After a couple of strokes, gradually let the full weight of the saw do the work. Don’t try to add extra pressure, or you’ll likely cut off line. Since cutting dovetails is a Rip operation, the saw plate is filed Rip, is .020” thick, and has .003” of set on each side. The saw plate is made of Swedish Steel, and is hardened to 50-52Rc, which will stay sharp for a long time, but allow re-sharpening with a small triangular file. The back of the saw is a beautiful piece of solid milled brass. This saw is now 10” long, growing an inch compared to the previous iteration, allowing a longer stroke. The saw has an open style handle, which fits hands of many sizes. The handle is made from beautiful curly maple and is held on with screws using split nuts. Below is a picture, with the split nut driver highlighted, to show what tool you will need to adjust the split nuts. I personally find the open style handle preferable on a dovetail saw, compared either to a closed style handle or a gents style handle (which is a straight handle in line with the spine of the saw). If the saw had a closed style handle, it is likely that the balance of the saw would be upset, as the closed handle is heavier since it requires more wood. On the gents handled saws, it is easy to accidentally grab the handle, with the blade not quite straight up and down, and to lose your point of reference. I hold my saw handle with my lower three fingers and thumb, while my index finger points out and down the saw plate. The open handle, in and of itself, provides some indexing with my hand and provides feedback as to how I am holding my saw. While this is true, the pointed index finger helps me know the saw plate is in line with my forearm, as long as my wrist isn’t flexed to one side or the other. Why is this important? Let’s compare this to shooting a pistol. I know the index finger is actually on the trigger, with a pistol, but we’ll focus on the alignment issue of the tool to the forearm. When I aim a pistol, I point my forearm and hand towards my target, and of course my pistol. If I flexed my wrist either to the left or right, even though my forearm is still pointed in the target’s direction, I wouldn’t hit dead center. When using a saw, my arm works like a piston, along the line leading to my target (which is the line I want to cut). If I flex my wrist, again I’m going to miss my target, and beyond that, the saw won’t work well. The most efficient usage of a handsaw is when the saw is in line with your arm and target (cut line) and you move the saw back and forth like a piston. Once you get used to using a saw in this way, many inaccuracies go away. I’ve always loved the look of hand-cut dovetails, and when I first started woodworking, I found they seemed very difficult to cut accurately. So much so, that I thought I just didn’t have enough skill. For a number of years, I’d repeat the process of trying some more dovetails, getting frustrated, and putting my previous dovetail saw away. When Lie-Nielsen came out with their dovetail saws, I was lucky enough to have a friend that owned one that I could try. I was amazed at just how much difference a saw could make. Now, I won’t try to tell you that my first attempt with the Lie-Nielsen dovetail saw was completely flawless, but it looked so much better than anything I had done before and I could see all that I needed was practice. (Oh, and a Lie-Nielsen dovetail saw!) I immediately recognized just how important it is to have the right amount of set on a saw. My old saw had so much set that it made a kerf that looked wide enough to drive my car through. It really felt sloppy and because of that, required a great deal of focus in the attempt to follow a line. Since Lie-Nielsen’s dovetail saws have just .003” of set on each side of the saw plate, it just takes a little practice lining up the initial cut. Once you get to where you can start the saw on your line, it will track very nicely and all you have to do is provide the power. Just back and forth. I believe you’ll enjoy using the Progressive Pitch Dovetail saw. It can make a huge difference. Now go make some sawdust! Let me know if you have any questions or suggestions for future articles you would like to see. Click to take a closer look at the Progressive Pitch Dovetail Saw. Thanks for the recommendation! Have bought the dove-tail tool and it works great! This is a brilliant design. I’ve used the dovetail and I love it. It makes starting a cut so much easier the way the teeth are. Maybe I’m weird but I find myself looking for excuses to use it sometimes. The bottom line is that this is a highly recommended hand saw. 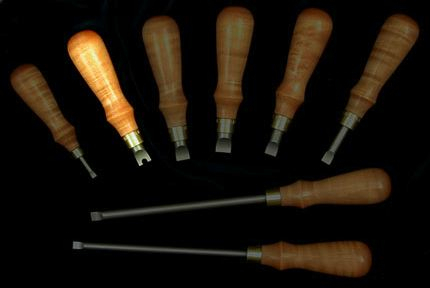 The Destroyer of Tools July 2012 Wood News is out!